Comm Eye Health Vol. 19 No. 59 2006 pp 36-37. Published online 01 September 2006. Consultant, VST Centre for Glaucoma Care, LV Prasad Eye Institute, Banjara Marg, Banjara Hills, Hyderabad, 500 034, Andhra Pradesh, India. Glaucoma affects approximately 65 million people around the world and an expected 7.5 million are blind due to the disease. It is the second most common cause of blindness worldwide.1 It is estimated that perhaps half the blindness from glaucoma in the world is caused by angle closure.2 Accordingly, in order to be effective, any case detection has to include methods to detect angle closure. Five components of the comprehensive eye examination are specifically relevant to assess glaucoma. Specifically in this instance to rule out secondary causes of glaucoma. This is preferably measured by applanation tonometry. Tonometry has poor sensitivity and specificity for the detection of glaucoma. Half the patients with primary open-angle glaucoma (POAG) have IOPs below 22 mm Hg at the first measurement. Further, as shown by the ocular hypertension treatment study (OHTS), only 9.5 per cent of patients with IOP above 21 mm Hg develop early glaucoma if left untreated for five years.4 Intraocular pressure measurement alone is an inefficient tool to detect glaucoma, but, if consistently elevated, IOP does play a role in the diagnosis. It is important to remember that the Goldmann applanation tonometer may record falsely high IOP if corneal thickness (not corneal oedema) is increased. This message is reiterated by the OHTS finding that in a thick cornea the risk of progression is minimal for patients with ocular hypertension. There is no consensus about which correction formula to use to adjust for corneal thickness; we use Elher’s formula, which applies a 5 mm Hg correction for every 70 μ of corneal thickness. Routine central corneal thickness (CCT) measurement is ideal; it should at least be measured in all patients with ocular hypertension and suspected normotensive glaucoma (NTG). As far as management is concerned, IOP is the only known causal factor and the only factor that we can alter therapeutically. Gonioscopy is the current gold standard for the diagnosis of angle closure and is mandatory for the diagnosis and management of all glaucomas. POAG is a diagnosis of exclusion, after a careful examination, including gonioscopy, to rule out angle closure and secondary causes. The presence of a single peripheral anterior synechia in an occludable angle (Figure 1) confirms the diagnosis of angle closure. The ideal technique is dynamic gonioscopy with an indentation-type lens like the 4-mirror Susmann gonioscope. The anterior chamber angle is a dynamic structure and it can change over a period of time due to changes in lens thickness, position, and other factors. It is therefore essential to perform gonioscopy on a routine basis, even in a ‘known’ case of POAG. Glaucoma is essentially an optic neuropathy and the key to diagnosis rests on examination of the disc and nerve fibre layer. 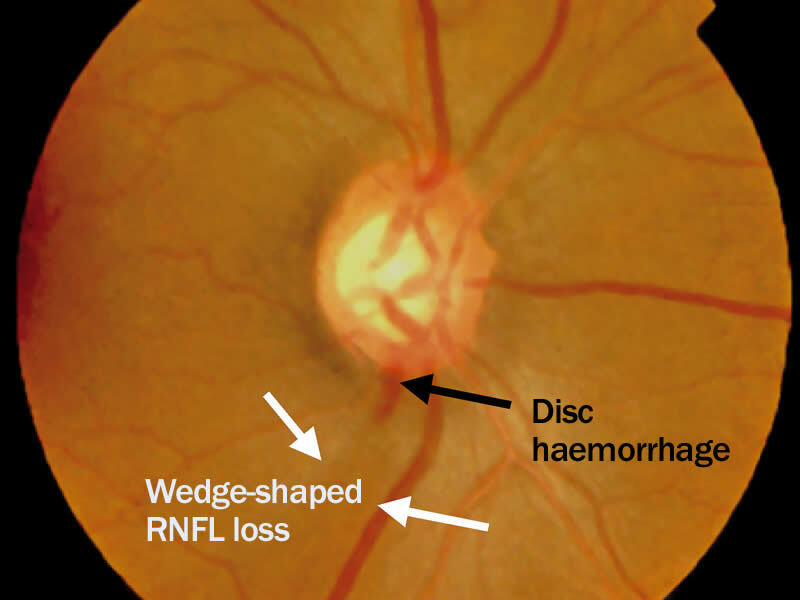 While stereo disc photography is the gold standard, clinical examination of the disc and retinal nerve fibre layer (RNFL) is best performed by a dilated stereoscopic examination on a slit lamp using a 60, 78 or 90 dioptre lens. The best stereoscopic view is with a contact lens, but logistics prevent its routine use. When there is a doubt, we would still use a contact lens. Unless contra-indicated, the disc, RNFL, and fundus should not ordinarily be assessed with undilated pupils. The numerous signs that need to be sought during disc assessment are beyond the scope of this article; they include rim thinning or notch, disc haemorrhage, wedge-shaped RNFL, etc. (Figures 2 & 3). 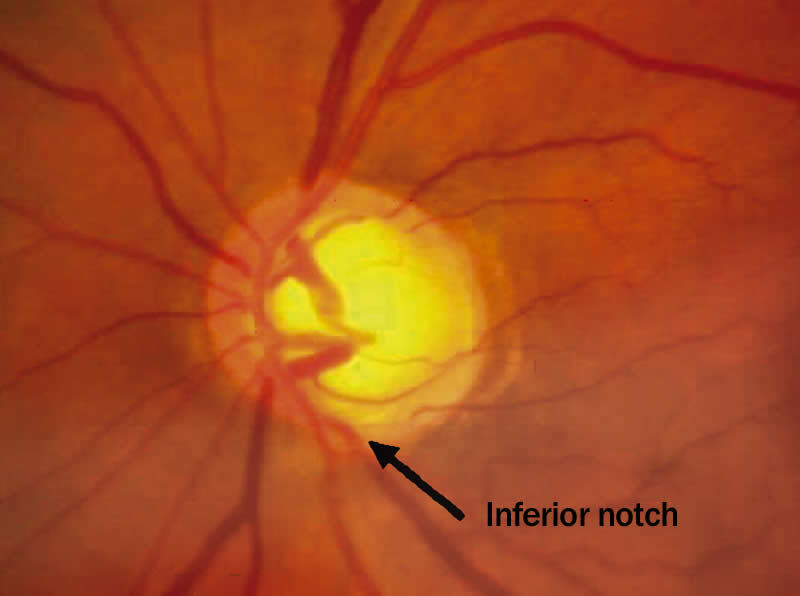 Newer imaging techniques are now available for documentation of the optic disc. These include the Heidelberg retinal tomogram (HRT), scanning laser polarimetry (GDX), and optical coherence tomography (OCT). The Association of International Glaucoma Societies (AIGS) consensus meeting concluded that at present there was insufficient evidence to validate the routine use of these instruments. The meeting also concluded that, in the hands of a specialist, imaging techniques can provide valuable information. We concur with these conclusions. We also feel that these instruments have a great potential for follow-up. The goal of glaucoma management is to preserve the patient’s visual function and quality of life. The gold standard for the detection of functional glaucomatous damage is automated ‘white on white’ perimetry. This test is mandatory to document functional damage, its progress and its response to treatment. In areas where primary surgery is necessary, the presence of a confirmed functional defect puts a decision for such intervention on a firm(er) footing. We first need to obtain baseline fields, both for diagnosis and for comparison on follow-up. The first few fields usually demonstrate a learning curve and cannot be used as a baseline. 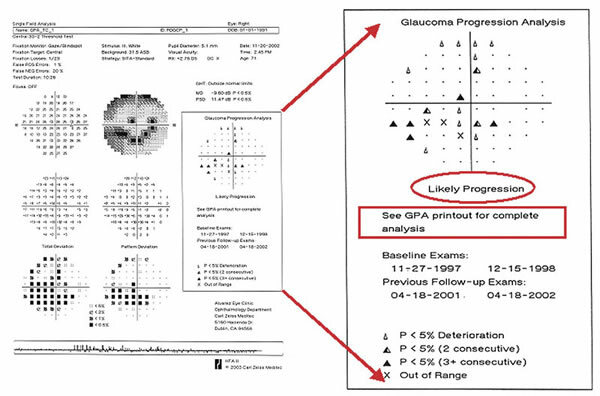 To determine progression, we currently use the overview programme (Figure 4) and the glaucoma progression analysis (GPA). The GPA provides statistical help to determine progression (Figure 5). Frequency Doubling Perimetry (FDP) is a rapid and relatively inexpensive test that can accurately detect established field defects. FDP has a high sensitivity and specificity. It can fulfill the objective of confirming a field defect prior to surgery, but does not have the programmes for follow-up. The Bjerrum Screen is good enough for documenting a defect, and, if it correlates with the other findings, is enough to go to surgery. The demonstration of a functional defect becomes especially important in the areas where we would go for primary surgery. The Bjerrum Screen, however, is not good for follow-up. Figure 5. 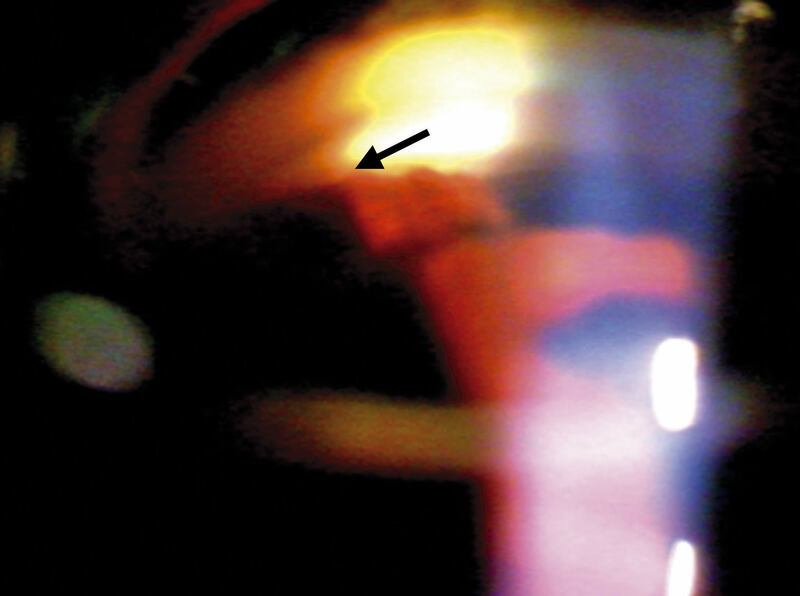 Glaucoma progression analysis: single field print-out. Tonometry will only detect angle closure in a patient with raised IOP. 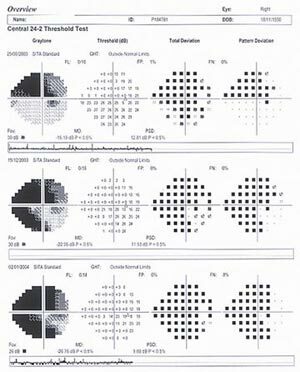 The structural and functional tests described for POAG (optic disc examination, perimetry) will only detect angle closure that has damaged the disc or visual field. As approximately 75 per cent of subjects with PACG in Asia have optic nerve damage, strategies that detect functional damage in POAG may also be suitable for PACG. However, such tests will not detect eyes without functional damage or eyes at risk for angle closure. Such eyes at risk, and those with early disease, are the ones we need to detect. In these cases, an iridotomy can be curative. The ideal way to identify angle closure and eyes at risk is to examine the angle using a gonioscope. The clinical expertise required renders gonioscopy inappropriate for screening; however, it is necessary for clinical practice. The AIGS consensus meeting on angle closure concluded that gonioscopy is mandatory in the clinical situation. In the flashlight test a light is shone from the temporal side onto the cornea, parallel but anterior to the iris. A shadow on the nasal limbus identifies an eye with a shallow anterior chamber, at risk of closure. Considering the sensitivity and specificity of this test, the AIGS consensus meeting concluded it has no role to play in the detection of angle closure. The van Herrick test uses a slit beam to compare the depth of the peripheral anterior chamber to the thickness of the cornea. When the depth of the peripheral anterior chamber is less than 1/4th of the corneal thickness, it is considered shallow (Figure 6). The sensitivity and specificity of the test does not meet the recommendations of Prevent Blindness America for screening. It is also important to remember that the flashlight and van Herrick tests do not detect angle closure but occludable angles, which are only a risk factor for angle closure. This distinction is important because only a minority of occludable angles progress to angle closure. Using the van Herrick test for screening will result in too many false positives. In summary, the clinical assessment of a patient for glaucoma requires a complete comprehensive examination (including gonioscopy) on all adult patients seen in the clinic, followed by appropriate investigations (visual fields) to document damage and follow up patients with suspected glaucoma as well as confirmed cases. 1 Quigley HA. Number of people with glaucoma worldwide. Br J Ophthalmol 1996;80: 389-93. 2 Foster PJ, Johnson GJ. Glaucoma in China: how big is the problem? Br J Ophthalmol 2001;85: 1277-82. 3 Thomas R, Parikh R, Paul P et al. Population-based screening versus case detection. Indian J Ophthalmol 2002;50: 233-7. 4 Kass MA, Heuer DK, Higginbotham EJ, et al. The ocular hypertension treatment study: a randomized trial determines that topical ocular hypotensive medication delays or prevents the onset of primary open-angle glaucoma. 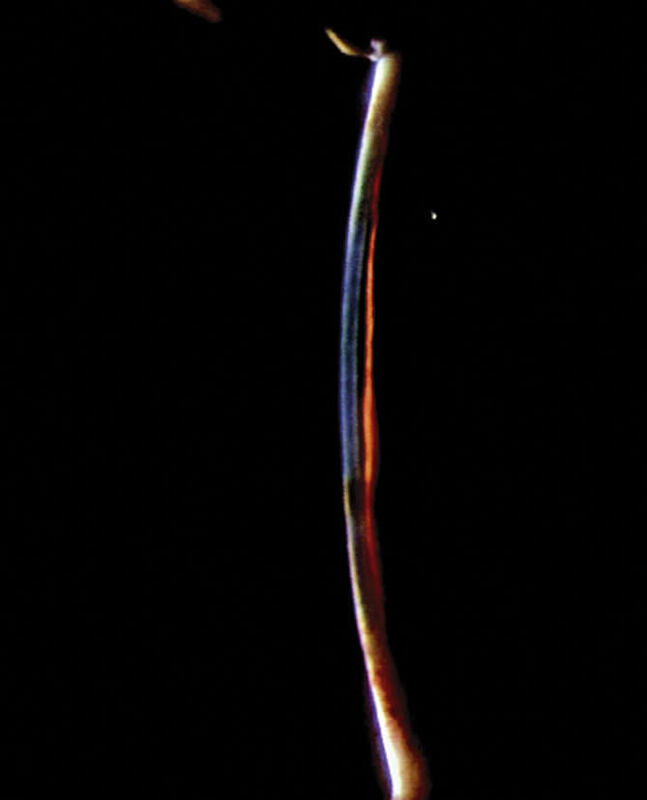 Arch Ophthalmol 2002 Jun;120: 701-13. 5 Thomas R, George T, Muliyil J. The Flashlight and van Herrick’s Test are poor predictors of occludable angles. Aust N Z J Ophthalmol 1996;24: 251-6.